The PS3 exclusive inFamous arrives on store shelves today. Reviews have been positive thus far, and players who might be reluctant have a demo to play that may change their minds. 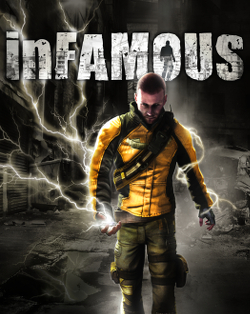 "inFamous is the story of Cole McGrath, a bike messenger given an assignment to deliver a package that is secretly a bomb. Cole survives the massive explosion and develops electricity-based powers. Soon, Cole discovers that his city has fallen into chaos under the rule of gangs and factions and must fight back against them to restore order. The game allows players to choose what path they would like to follow. Players taking on more good deeds will receive more helpful and exact powers while those who do bad deeds will have more destructive powers."